Galway-based 9th Impact, who build games for mobile phones, have released their newest game to the App Store today, July 1st. Robotory is an endless arcade game, exclusively on iOS, which features a group of Robots who are trying to escape their factory as the floodwaters rise. They must jump through layers of pipes and moving floors while avoiding the drones and electric fences in their way. Inspired by the classic Jumping Jack game which older gamers will remember from the ZX Spectrum and with some Crossy Road influences and an almost Machinarium graphic style, the game features super simple controls and endless free gameplay which makes it perfect for a pick-up-and-play mobile game. Every few games there is a casino type slot machine which players can spin for the chance to unlock new characters (which they can otherwise purchase) or win golden nuts, which are the game’s currency. The golden nuts are used to revive the robots when they’ve met their end, so you can keep playing although there is a maximum of 3 revives allowed per game. The first game made by the outfit at the Galway Technology Centre, was called NinjaGo Endless Runner and has been played more than three million times in six months. We featured it on gd.ie last year. 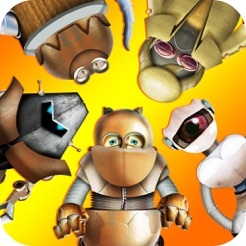 Robotory is now on the App Store. In December 2014 Geoff Newman of Endlife Studios interviewed some members of the Irish game development community about how 2014 was for them and what they expected from 2015. He has now published and shared this work with everyone. Poke the Bear has just released Chameleon Falls on Google Play. Poke The Bear is a new Irish “Studio” based in Bray, Co. Wicklow. To date, our focus has been on developing educational content and games. Chameleon Falls is our first casual game and its totally FREE! Prepare to blister your thumbs and pull your hair out. Chameleon Falls will challenge your reflexes and your will. This unique Runner game challenges you the player with obstacle negotiation on one hand and colour matching on the other. – 9 Completely different story levels plus a beginner Introduction level. – 4 Unlockable Randomly generated practice challenge runs, including an infinite runner. – A store where you can top up on Coins and other Inventory, and also purchase add-ons like “Ad Removal”. The first general meeting of Imirt, The Irish Game Makers Association, will be held on the 30th of June in Odessa at 5.30pm (before DubLudo). This is a chance to get talking about Imirt directly. We’re going to gather the seats around to create a comfy and open meeting for anyone who wants to attend. We will also use GoToMeeting for online participation too! The plan is to present some slides for 15 minutes. These will cover the last few months of steering committee happenings (also covered in the public minutes), from formulating the goals from the public survey, to the legals of the new organisation, as well as future steps and announcements. Then we’ll switch to Q&A for the rest of the event. Questions can come from the room or from people watching online. We will also share the slides ahead of the meeting. Finally, on the night we’ll be doing the first member sign-ups for the organisation. The annual cost is €20 and is open to anyone interested. Gazzapper Games has just shared their latest game – just in time for Wimbledon. Tennis game in Retro form using Real Pro Tennis Scoring system. Play tennis against CPU or second player! A lightweight tennis game for your tablet. Play it during French or US Open or Wimbledon events! Best played on larger phones and tablets. Just like playing a retro tennis game. Occasionally gamedevelopers.ie organises informal social gatherings. What is infrequent is special – and on Thurs the 25th we aim to bring all the different groups together for a summer meet up, some drinks and if you wish, some food. Find out what is happening, see who is hiring, discuss courses and games. Venue is the DTwo Beer Garden in the Harcourt Hotel on Harcourt Street in Dublin. It is quite near to the Odeon on the same side of the street. Head out to the back beer garden. We have reserved an area on the left hand side with long benches. Look for our logo as above – to find the group. This should be clearly visible on the night. Kickoff is at 7 pm on Thurs the 25th of June. We know that Animation Skillnet is having a Summer Cookoff in the Odeon that evening from 6pm so hopefully there will be some crossover and people can make both if necessary!. Tell us you are coming so we can reserve enough space – see our page on event brite. We have just created a new section on gamedevelopers.ie to provide a home for an alpha timeline of the Irish Games Industry. Find out when Atari was in Ireland, or Sony launched its GAA game. Watch videos, check dates. This was originally compiled by Jamie McCormick to show visitors that Ireland has a relatively long history in various aspects of the games industry and culture. The timeline breaks out events in the history of the Irish games industry into industry events/policy decisions and company/team formation split into Game & App development, Games technology/middleware, industry services, publishing and retail/consumer services. The timeline uses information released in Jamie’s Games Industry in Ireland 2012 report, plus associated lists in our forums, combined with company formation dates from CRO or Companies House, or if unavailable, the date a website was registered. ~70% of entries were formally registered as companies in some shape or form. To date the project has had valued input from across the Irish game development community, Games Fleadh, State of Play, Dr. Aphra Kerr, Mr Phil Bourke, Enterprise Ireland, IDA Ireland and Invest Northern Ireland. The project stalled in May 2014 when Scraggly Dog Games and GetIrishGames closed down. Now we have resurrected it and we want you to get involved. We would like you to help improve it? You can use the contact form here on gd.ie to send us information. Just put [timeline project] in the message header. We’re also interested in videos, photographs, screen shots related to each company and team. Happy to correct things too. Thanks to everyone who has volunteered to date. We have been a bit slow on organising volunteers what with holidays etc. but we are gearing up now. We have sufficient technical and web skills now in our team. But we are always looking for more folks to write. Feel free to drop us a line. GameDevelopers.ie is a non-profit, volunteer run site that has been supporting the Irish games scene for thirteen years now. We aim to provide an openly accessibly source of information on what is happening in the local game scene, amateur and professional, and an archive of what has happened. A few people have put in a lot of work into having a platform that provides the local community, students, hobbyists and industry, with coverage of games and play related news, a free place to advertise jobs and Irish made games, and feature articles for more in-depth stories. Overtime volunteers have moved on, emigrated, or got very busy in work, and the number of people actively running the website has dwindled. We usually have to renew things every couple of years. This is where you come in. Firstly, there are still bugs with the new wordpress site and we need to fix the site to work on mobile devices. So we need some more technical volunteers who can help with that. Second, we have a massive archive of material from our thirteen year archive we need to have properly categorised. We have to compare and contrast current content with the old site, so we can make sure that all the features and articles are back online again, in a fully searchable format. (This could be interesting for someone looking to explore the scene over the past decade in more detail). So, we need self-starting volunteers with the following skills or interests. – 3. Security specialist, who can do a full security audit of GD.ie systems, so we can make sure a hack doesn’t happen again. – 5. News writers, who can write short reports on local events around #IrishGameDev and write short news pieces on breaking Irish games news – this could also be short video pieces. – 6. Feature writers, who can write in-depth pieces and interviews with people in the local industry. This is not a lifetime commitment – if you can only do stuff for a couple of months or less that is okay. A benefit of the new site is that we have better statistics and a more secure structure. So in addition to the above we are currently starting to look for sponsorship from companies in #IrishGameDev. There are two types of sponsorship we’re considering. We have space for one primary sponsor on the homepage, and three secondary sponsors, which will be prominently featured across the site. You can promote a company/product/event, or if you are releasing a game, you can have a game logo to drive traffic to the game page. If you would like more information, please get in touch with aphra [at] gamedevelopers [dot] ie with the subject “GameDevelopers.ie Sponsorship”. Havok needs little introduction on this site. The award winning Irish technology company based in Dublin and leading provider of interactive 3D game development technology, has launched a new product Havok FX, a brand new CPU-driven software product that will deliver unprecedented levels of detail and physics to particle effects. The result of extensive research into massive scale high performance Physics simulation, Havok FX allows developers to physically enable particle systems and to add a new gameplay dimension to previously aesthetic visual effects. Leading publisher Ubisoft is one of the first publishers to announce their support of this new product through their adoption of Havok FX within Tom Clancy’s Rainbow Six Siege arriving in October 2015 for PC, PlayStation 4 and Xbox One. Through its focus on CPU processing, Havok FX offers a lightweight, cross platform solution to creating dynamic and persistent particle effects across all next gen platforms and PCs. Shrapnel, dust, goo, debris and smoke will interact with both the player and the environment, increasing the fidelity of the game world while also offering designers the ability to deliver gameplay altering effects. Artists now have the freedom to create the richer and more dynamic environments at a scale that modern AAA gaming demands. “Havok FX brought all we needed to push the realism of Realblast, our procedural destruction engine, to a whole new level. With each explosion you see debris, shrapnel and fragments all flying through the environment and reacting dynamically, making each assault even more tense and realistic,” says Mark Besner, Lead Programmer at Ubisoft Montreal. As presented at State of Play 2015 in Dublin by Chris Gregan, Fungus is an open source tool and we are delighted to hear that it is now available via the Unity Asset Store. Add colourful characters and craft gripping storylines for your game – for free and with no programming! Not sure how you get the hats, but clearly there is a revenue stream right there! Exciting news for Colm Larkin, Gambrinous and the Irish indie game dev scene. Gambrinous, an independent game development studio located in Dublin, Ireland and indie publishing powerhouse Versus Evil have announced a July 14 release date for the highly anticipated dungeon-building role-playing game (RPG) Guild of Dungeoneering. The game will be available for $14.99 and is available for PC and Mac. Eager Dungeoneers who pre-order before the launch date can secure a bounty of booty in the form of the Pirates Cove Adventure Pack . This swashbuckling DLC pack includes one new region, two new dungeoneer classes and five additional adventures that all have separate, unique quests. The Pirates Cove Adventure Pack will become available after the game is released, date to be announced, with a regular purchase price of $4.99. Guild of Dungeoneering is not your average dungeon crawler. In the game, players build a dungeon around a wandering hero with cards dealt from a deck. This leaves the dungeoneer to makes his own choices based on the world that is being constructed around him, his personality traits and the monsters he has to face. Between building and conquering dungeons, players will manage their guild and expand their guild decks to create more powerful items and attract new classes of dungeoneers. Gambrinous is an indie development studio headed up by Colm Larkin who has been making games since 2008 and has been developing the unique and stylish dungeon-creator RPG Guild of Dungeoneering over the last two years. Guild of Dungeoneering offers hours of dungeon-building and a different experience each time, thanks to the game’s different worlds and variety of deck-building options and its reverse rogue-like gameplay. This game won an indie most promising game award in Europe in 2015. See the game’s blog. Guild of Dungeoneering can be pre-ordered from: Steam, GOG, Humble Bundle, Gamers Gate, Direct to Drive, Green Man Gaming and Uplay.